This is the latest in a series of posts about some of my adventures in the Netherlands which took place over the summer. I've introduced the subject and talked about roundabouts. This week, I'm going to concentrate on a city street and a typical side street connecting to it. About 4km to the south-east of Amsterdam, in the neighbourhood of Watergraafsmeer, there is the Betondorp estate. One half contains a residential area and the other half contains the cemetery, crematorium and memorial garden of De Nieuwe Ooster. 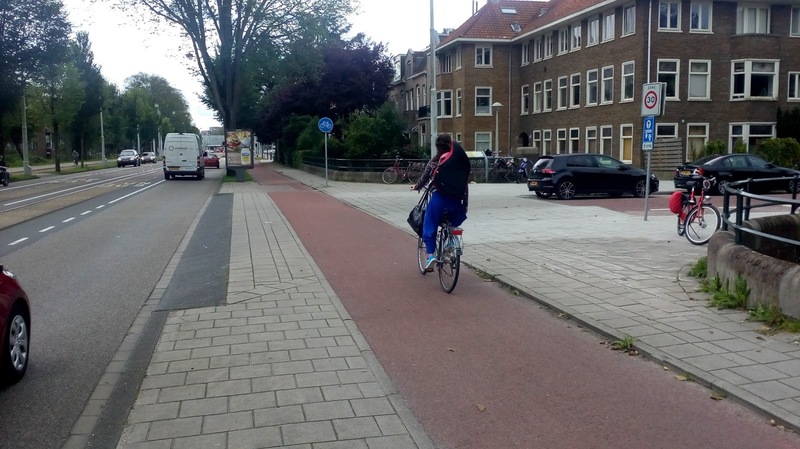 The residential area is filtered from through traffic (which has to stick to the main roads around it), but of course, one can cycle around and through the area. It's pleasant enough of course, but it is entirely unremarkable. One of the motor-vehicle access points into the estate is Zaaiersweg which meets the S113 Middenweg. 'S' roads (or stadsroutes) are city roads connecting the city to ring roads or motorways. At about 25m in width, Middenweg (photo below) crams in space for walking, cycling, trams/buses and motor vehicles. Again, it's an unremarkable width; compare with the 32m dual-carriageway of Stratford High Street in London for example. As usual, the Dutch are not focusing on just motor traffic. The logic is simple. Trams and buses follow direct routes which pass other motor vehicles and their routes ahead are also clear (so avoiding the traffic jams that one can see, even on Dutch roads). There is no messing about with nearside bus lanes which end at large junctions and have other drivers turning across them. In other words, interaction with other vehicles is minimised. Drivers turning into and out of side streets such as Middenweg can also use the central tram/bus lane to turn across traffic in two parts if needed. The bus and tram stops on streets like this are often floating (see below) and in some locations, they have controlled crossings to get passengers to and from the islands. The verge is an important piece of the puzzle because as well as providing a buffer between motor traffic and people cycling, it provides space for planting and street furniture. 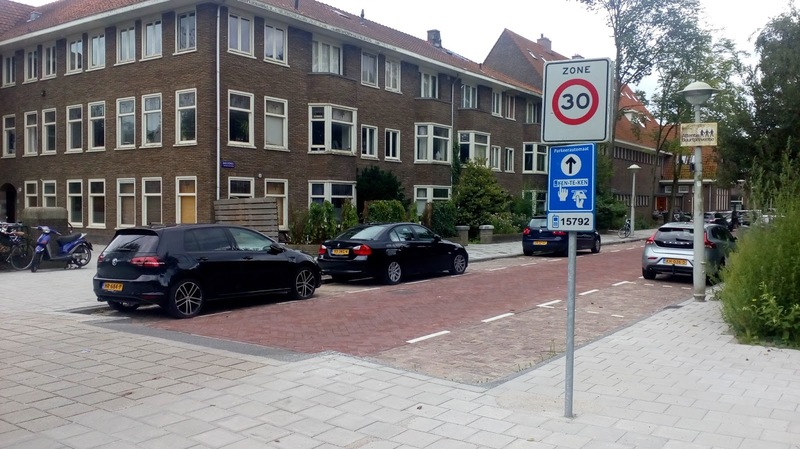 It also provides a place into which drivers can pause to turn in and out of the side street without impacting on people walking and cycling too much - the usual UK approach has a driver in this position often blocking people walking and cycling. 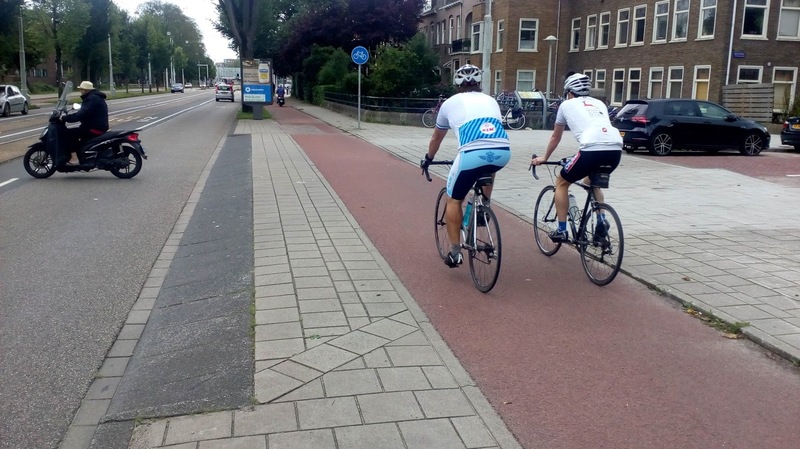 As you can see in the photos above, the guy pulling out of the side road is able to see who is coming along the main road and once the guy on the bike has passed, he can then think about joining the main road. In effect he is giving way twice. The verge is paved in this location which gives a little more waiting space (these areas are sometimes larger). You can also see that the footway and the cycle track are continuous across the junction to give actual and visual priority to active travel. It not just a continuous footway and cycle track we have here, it is kept completely level across the side street. 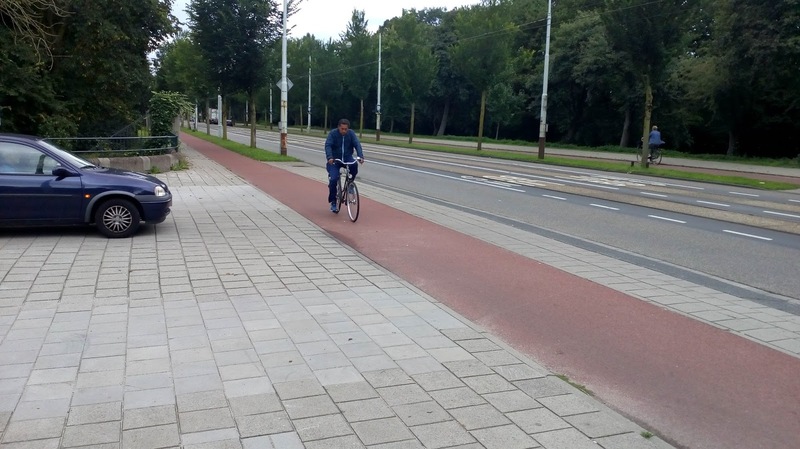 This is achieved by special kerb units called inritbanden which provide a slope from carriageway level up to that of the footway and cycle track (see above and below). 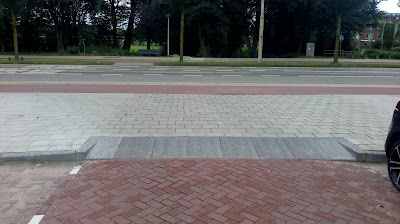 The cycle tracks along Middenweg are nominally one-way and so if you need to turn left out of Zaaiersweg, you're going to have to cross the road (2 traffic lanes and 2 bus/ tram lanes). It's not ideal, especially when the road is a little busier, although in this case, you could turn left and then U-turn through a protected intersection a couple of hundred metres away. The photo above is a closeup of the inritbanden kerb. In this case, the ramp is about 500mm long and rises about 110mm. It therefore gives a fairly gentle slope, but it is steep enough to give those driving a definite obstacle to deal with in order to keep speeds low. As can be seen in the photo above, the arrangement of the junction gives drivers a cue that they are entering a lower speed environment which is reinforced with the 30kph (20mph) speed limit. As one enters the street it is very narrow (but still 2-way) and from a cycling point of view, there is no infrastructure at all. However, speeds are pretty low, the estate is filtered and so none is required. 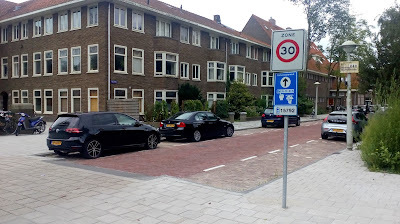 There is a controlled parking zone and some pay-by-phone parking which further reminds us that the Dutch aren't especially anti-car, but they are certainly pro-choice in transport terms. This type of junction is simple, logical and sensible. It is safe and comfortable to use. 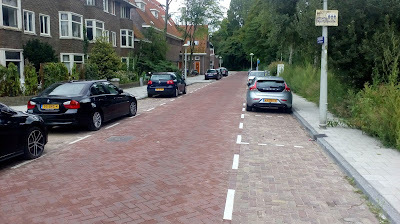 Despite the UK not having inritbanden kerbs (I have raised the idea with one UK manufacturer), we can certainly copy this approach in the UK - in fact, it should be the default in this kind of situation. I'd love to see inritbanden kerbs introduced in the UK. 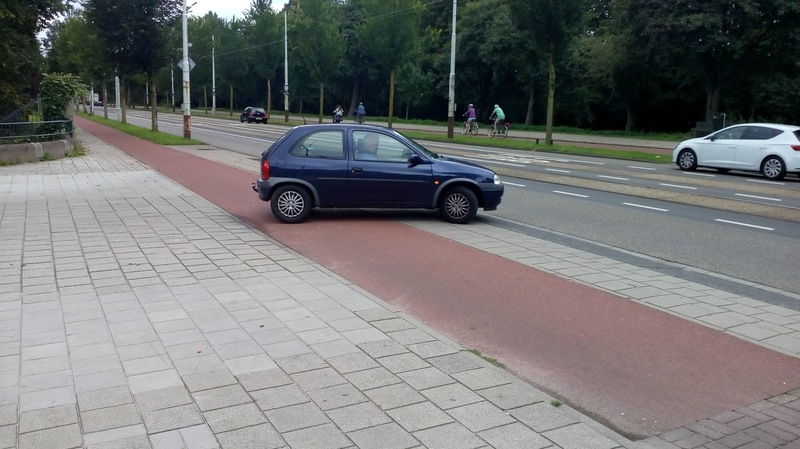 Our approach to vehicle crossovers is lamentable. I've just completed a pedestrian audit for a town near me, and what is really striking is the level of intrusion of motor traffic on already very limited footways. We have traffic signs and parking meters taking space from the footway, then continual level changes to accommodate vehicle movements across the footway, the vehicle movements taking place across a pretty level surface. And of course if you want to cross the road, well lets disrupt the pavement again, because cars changing level would be wrong, wouldn't it? We definitely need these kerbs - we can delivery the same approach, but it is fiddly with our tools. I hope the company I met are going to look more closely! The one problem that's been pointed out to me with regards the inritbanden kerbs is how blind/VI pedestrians might deal with them if they're picking up the normal kerb edge as a guide. 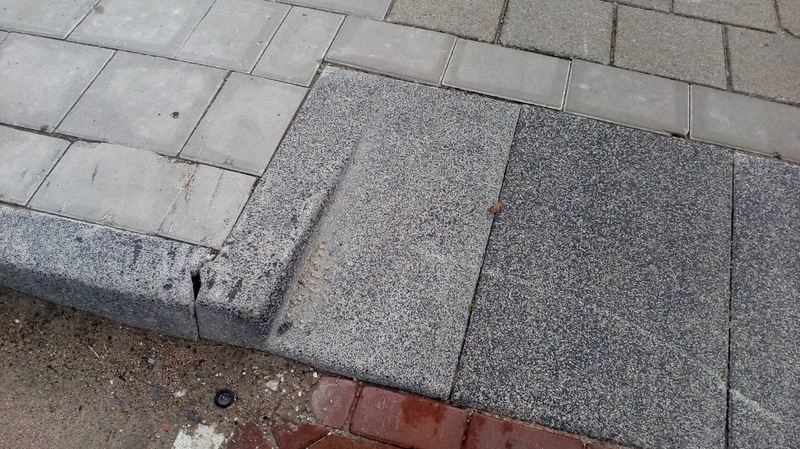 Might they actually be more detectable than a typical dropped kerb for a vehicle crossover? 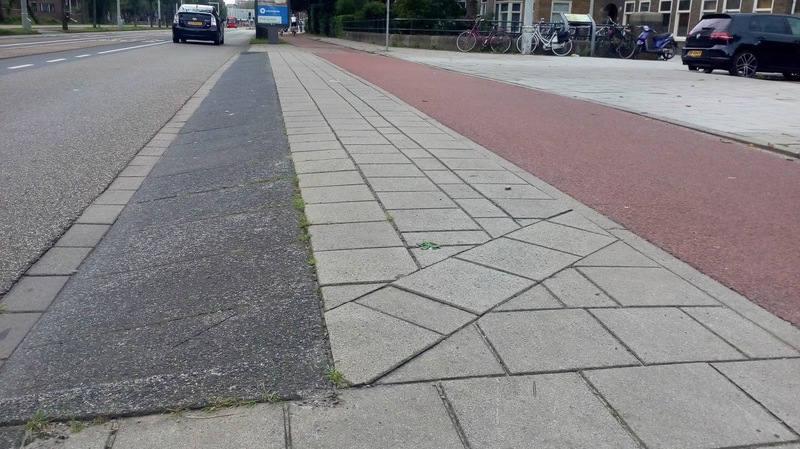 A 25mm upstand is less than that required for near universal recognition by VI pedestrians, and I would have thought the gradients change on the inritbanden might be at least as easy to detect as a typical UK dropped kerb, though that is speculation. In the first paragraph you mention Watergraafsmeer as being southwest from the center of Amsterdam. That should be southeast. Whoops! Thanks very much - updated. A bit late to the party, and you might've learned of this by now, but I thought it's somewhat relevant: Those inritbanden indicate, well, an 'inrit' (or 'uitrit'). Which by Dutch law automatically has to give way when coming from such a road. This might seem obvious from the design, but it's good to be aware it's also backed by law. I suspect the concept riginated simply as an 'inrit'/'uitrit' of homes etc, but then the rules where generalized to apply to all these situations.